Mumbai/New Delhi: Low-fare airlines IndiGo and GoAir cancelled at least 66 flights on Tuesday, a day after regulator Directorate General of Civil Aviation (DGCA) grounded 11 Airbus A320neo aircraft powered by Pratt & Whitney engines following instances of glitches. InterGlobe Aviation Ltd-run IndiGo had eight of these planes while Wadia Group-run GoAir had three. Some of the flights that were cancelled on Tuesday were on busy routes including Delhi-Mumbai, Delhi-Kolkata, Guwahati-Delhi, Indore-Mumbai and Delhi-Hyderabad. Operations at both airlines are expected to be significantly disrupted ahead of the peak travelling season that starts in April when schools and colleges in India shut for summer break, and people head out for holidays. In a statement, Pratt & Whitney said it can mitigate the engine issue by the end of second quarter, prompting analysts to predict an erosion in market share of IndiGo. “Pratt and Whitney engine issues will take a while to get resolved," analysts at brokerage Edelweiss Financial Services Ltd wrote in a research note on Tuesday, recommending selling the stock. “This will hurt IndiGo in the near term and may lose market share to domestic peers." India’s largest carrier IndiGo carried 4.56 million passengers in January, according to government data, accounting for 39.7% of the total market share among domestic airlines. GoAir carried 1.1 million passengers during the same period and had a market share of 9.6%. The total number of domestic travellers during January stood at 11.47 million passengers. HDFC Securities Ltd analyst Vishal Rampuria said the groundings have led to about 2% of supply going out of the market. He expects supply to remain weak for a couple of months. 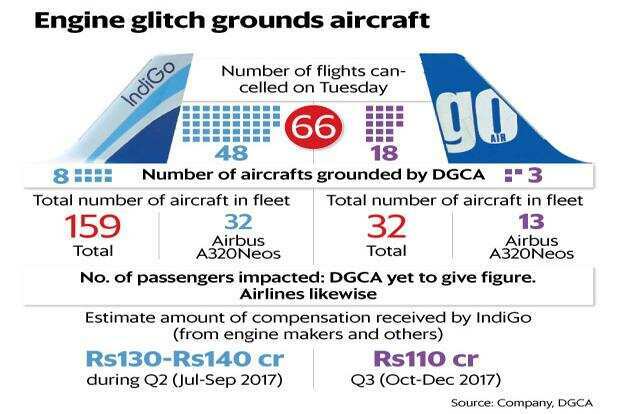 To be sure, the grounding of 11 aircraft on 12 March by DGCA and three earlier, account for only 3% of the total fleet maintained by the domestic industry, said Icra’s vice-president of corporate ratings Kinjal Shah. The glitch with the so-called knife-edge compressor seal causes vibration in aircraft, forcing Indian authorities to ground these, even as European Aviation Safety Agency, the primary regulator for Airbus planes, has said that the jets are safe if they have a single affected turbine. Minister of state for aviation Jayant Sinha on Tuesday told ANI that safety remains a priority for the government. The minister didn’t say how long the aircraft are expected to be grounded. “Forty-three such engines (with glitches) are there worldwide out of which 19 are in India and are being used by Indigo and GoAir. We don’t consider these safe, technical analysis is underway and these engines can only be used when we consider it safe," Sinha said. Civil aviation minister Suresh Prabhu said the move was the aviation regulator’s prerogative and that safety is paramount. “This is only for passenger safety and airlines have also responded positively. They would like to restore the flights as soon as possible by making alternative arrangements," news agency PTI said, quoting Prabhu. India’s largest carrier IndiGo is likely to take several aircraft on wet lease to cater to the upcoming summer season, said a person aware of the matter. A wet lease is an arrangement whereby one airline (the lessor) provides an aircraft, complete crew, maintenance, and insurance (ACMI) to another or other type of business acting as a broker of air travel (the lessee), which pays by hours operated. A spokesperson for IndiGo declined to comment on whether the company will wet lease aircraft. “While we understand that this may cause inconvenience to some of our passengers, given that we have multiple flights to the same destination, we are proactively re-accommodating all our affected passengers on other flights," it said. A GoAir spokesperson confirmed that the airline had cancelled 18 flights from over eight cities on Tuesday due to grounding of some of its planes. The Wadia-run airline will not lease any planes. IndiGo and GoAir are expected to recover a chunk of their losses through compensation paid by engine makers and insurance companies, two people aware of the matter said, adding that the compensation could lessen the financial impact of the flight groundings. According to estimates, IndiGo received a compensation of about Rs130-140 crore during Q2, (July-September 2017) and for Rs110-115 crore for Q3 (October-December 2017)," said the second person who didn’t want to be named. The person added that there are two components in payouts received by IndiGo, which include payouts on loss of profit and reimbursement of lease. Compensation is on grounded aircraft (due to technical glitches) and delay in delivery of new aircraft. However, aviation expert Mark Martin, founder and chief executive of Martin Consultancy, said that airlines lose about $7,000-8,000 of potential revenue an hour for grounding of an aircraft. “Short-term leasing is about 30% more expensive than dry lease, and airlines would want to avoid that cost," Martin said.